Lens Culture and its international jury of experts announced nine top winners and 27 honorable mentions for the International Exposure Awards 2012: the best in global photography and multimedia. See the full details online at Lens Culture. The 36 winners represent work from 17 countries. squido lense . This is the 4th year for the annual Awards competition, and the judges reviewed work submitted by artists in 52 countries. Enjoy! This entry was posted in Contemporary Photography, Uncategorized and tagged Awards Competition, Contemporary Photography, Culture, Global Photography, Honorable Mentions, International Exposure, International Jury, Photographer, Photographers, Photographs, Photography. on December 4, 2012 by Jim. In the clip above, Alex Prager, in conversation with gallerist Yancey Richardson (September 30, 2010 at Aperture as part of the Parsons Lecture Series), talks about wandering through the Getty Center one day, never before having considered photography, stumbling upon William Eggleston’s print of old shoes under a bed and being completely moved and inspired to pick up a camera for the first time. Prager’s work is original, intelligent and seductive. She thoroughly deserves her place in the company of former Foam Paul Huf winners, which is fast becoming a who’s who of contemporary photographic practice. The annual € 20,000 prize is awarded to a photographer under 35 years of age, who then goes on to present their work in a solo exhibition at the Foam Museum. Prager’s saturated, cinematic, stylized and glamourously surreal photographs will be on view in Amsterdam August 31, 2012 – October 14, 2012. Prager will also have a multi-city solo exhibition, Compulsion, on view simultaneously at Yancey Richardson Gallery in New York, M+B Gallery in LA, and Michael Hoppen Gallery in London, April 5, 2012 – May 19, 2012. Huffington Post has a behind-the-scenes photo exclusive of the show and Q&A with the photographer. This entry was posted in Awards & Prizes, Contemporary Photography, Exposures, Uncategorized, William Eggleston and tagged 22nd Street, Alex Prager, Compulsion, Contemporary Photography, Events & Exhibitions, Foam Amsterdam, Foam magazine, Gallery 3, Getty Center, Huffington Post, International Jury, Jubilee, Lecture Series, London Sw3, M+B gallery, Michael Hoppen, Michael Hoppen Gallery, MoMA, New Photography, news, North Almont Drive, Old Shoes, Parsons Lecture Series, Paul Huf, Photographer, Photographers, Photographic Practice, Photographs, Photography., Simon Baker, Solo Exhibition, William Eggleston, Yancey Richardson, Yancey Richardson Gallery on March 23, 2012 by Aperture Foundation. A 22-minute presentation of the winners of the Lens Culture International Exposure Awards 2011 — some of the best in global photography and multimedia today. The nine top winners and 25 honorable mention winners represent work from 14 countries – submitted by artists from 48 countries. The winning entries cover a broad and diverse range of subject matter, stylistic approaches, and technical processes. Enjoy! These award winners are currently being screened at film festivals and international arts venues around the world, including the SPE National Conference Film Festival in San Francisco; the Houston Center for Photography during FotoFest 2012; The Bilder Nordic series in Olso, Norway; the Voies Off Festival in Arles, France; the international photo festival in Tuscany, Italy: Cortona On The Move — and venues in Paris, London, New York, Brisbane and others to be announced. lensculture.com/awards. The competition is now open for new submissions! This entry was posted in Contemporary Photography, Uncategorized and tagged Arles France, Arts Venues, Awards Awards, Contemporary Photography, Cortona, Film Festivals, Fotofest, Global Photography, Honorable Mention, Houston Center, International Exposure, International Jury, International Photo, Minute Presentation, Olso Norway, Paris London, Photo Festival, Photographer, Photographers, Photographs, Photography Portfolio, Photography., Technical Processes, Tuscany Italy, Voies on March 16, 2012 by Jim. We’re pleased to announce the winners of the Lens Culture International Exposure Awards 2011 – the best in global photography and multimedia. The nine top winners and 25 honorable mention winners represent work from 14 countries. This award-winning work was selected from entries that came in from 48 countries. The quality, and sheer amount of submissions, amazed (and almost overwhelmed) the members of our international jury. The winning entries cover a broad and diverse range of subject matter, stylistic approaches, and technical processes. So, in many ways, the judges’ selections represent a true snapshot of some of the best photography and multimedia as it is being practiced today. Enjoy this winning photography here in Lens Culture, and be sure to click on the links to the websites of each of the winners, as well. We are planning a traveling show of screenings and projections for this work to be shown at galleries, theaters, schools, museums and other arts institutions around the world. Cheers to everyone who participated. And heartfelt thanks to every member of our jury this year. This entry was posted in Contemporary Photography and tagged Arts Institutions, Best Photography, Category Winners, Contemporary Photography, Global Photography, Image Category, International Exposure, International Jury, Justyna Badach, Kravets, Laura Stevens, Michael Marten, Morina, Multimedia Category, Pat Swain, Photographer, Photographers, Photographs, Photography., Portfolio Category, S Gayle, Stephen Vaughan, Tantawy, Winning Photography, World Multimedia on October 25, 2011 by Jim. Today is the deadline for the Lensculture International Exposure Awards. Lens Culture International Exposure Awards discover, reward, and promote talented, new, emerging and established photographers and multimedia creators from around the world. We’re looking for exciting work from every continent, and from diverse points of view: documentary, fine art, nature, photojournalism, activism, street photography, sports, fashion, poetic, personal, abstract and human. A stellar international jury of photography experts will review and judge every entry submitted. DEADLINE for entries is TODAY! This year, we introduce an important new category to the Awards competition — Multimedia. Presentations that combine photography, video, graphics and sound are becoming prominent headline features in the world of social networking, activism, fine art, and online news. Photographers are taking more and more control over how their work is edited, produced and presented. And we want to discover who is creating the most engaging multimedia projects today. Multimedia from all genres and categories will be considered, including, but not limited to: current events / photojournalism / social issues / activism / fine art / conceptual / cinematic / fiction / storytelling / nature / other. Maximum length should be 8 minutes. If your full-length multimedia piece is longer than 8 minutes, please submit an edit, or a trailer or teaser of 8 minutes or shorter. You can also submit one still image plus a link to your multimedia. The link should be part of your artist’s statement. Winners will be shown in their full original length. Entry fee: $75. Submit 10 to 15 photographic images that work well together as a group — thematically, aesthetically, as a story, or simply as a range of your photographic talent. Edit your selections carefully, since this category will be judged on the strength of the group of photographs as a whole, and not as individual photographs. Entry fee: $75. Often, a single powerful photograph captures our attention as important, artistic, meaningful, and memorable. A great photo can stand on its own, demonstrating a remarkable level of visual perception, sensitivity, and creativity. Photographs of all genres and all categories are welcome. Entry fee: $35. 25 Honorable Mention photographs or multimedia (chosen by the judges from all categories) will win prominent placement of a single image on the Award Winner’s Page in Lens Culture, including a link to your own personal or professional website. PLUS publication in our deluxe 2011 International Exposure Awards Winners catalog, and the possibility of participation in public exhibitions and screenings around the world. This entry was posted in Contemporary Photography, L E N S C R A T C H and tagged Art Nature, Awards Competition, Contemporary Photography, Engaging Multimedia, Headline Features, International Exposure, International Jury, Maximum Length, Multimedia Awards, Multimedia Creators, Multimedia Piece, Multimedia Presentations, Multimedia Projects, News Photographers, Photographer, Photographers, Photographic Images, Photographic Talent, Photographs, Photography Experts, Photography., Portfolio Awards, Social Networking, Street Photography, Video Graphics on September 17, 2011 by Aline - lenscratch.blogspot.com/. This entry was posted in Contemporary Photography, L E N S C R A T C H, Uncategorized and tagged Art Nature, Awards Competition, Contemporary Photography, Engaging Multimedia, Headline Features, International Exposure, International Jury, Maximum Length, Multimedia Awards, Multimedia Creators, Multimedia Piece, Multimedia Presentations, Multimedia Projects, News Photographers, Photographer, Photographers, Photographic Images, Photographic Talent, Photographs, Photography Experts, Photography., Portfolio Awards, Social Networking, Street Photography, Video Graphics on September 17, 2011 by Aline - lenscratch.blogspot.com/. 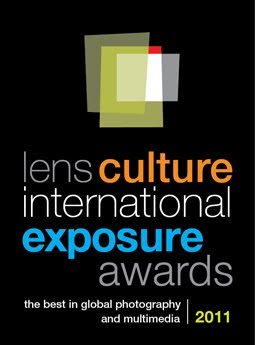 The Lens Culture International Exposure Awards 2011 competition for photography and multimedia is now open for submissions. This is our 3rd annual competition, and this year we have added an exciting new category — multimedia. We are especially thrilled to announce the members of our stellar international jury of photography experts who will review every submission. Please check out all the details, and enter your work today! Win cash prizes, global exposure, and more. This entry was posted in Contemporary Photography, Uncategorized and tagged Call International, Cash Prizes, Category Multimedia, Contemporary Photography, Culture, Global Exposure, International Exposure, International Jury, New Category, Photographer, Photographers, Photographs, Photography Experts, Photography., Submission, Submissions on July 1, 2011 by Jim.